The objectives of this organization shall be to promote the knowledge and growing of the genus Hemerocallis through programs, workshops, exhibits, and fellowship with other growers at the local, regional, and national level of the American Hemerocallis Society. 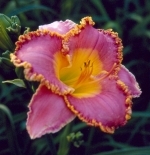 Membership in the Hattiesburg Area Daylily Society is open to anyone who shares the love of daylilies and who is in harmony with the objectives of the Society. Click the Contact link to request additional membership information. Click here to download a Membership Form. The form includes information concerning annual dues and meeting dates. Note: The Membership Form is in Adobe Reader (PDF) format. If you do not have the Adobe Reader installed on your computer, it can be downloaded by clicking this Get Adobe Reader icon.